After waiting a few weeks, the 8 inch square swatch I ordered of the hanky before committing to the full run, has arrived – and I think it looks very good, considering. I did just one corner of the hanky at full size so I could see how well the artwork was reproducing. The colours are looking pretty good and the feel of the fabric I choose, (a 60% bamboo, 40% cotton mix) has a surprisingly loose, limp drape to it, making it not dissimilar to a real hanky or scarf of this type. Spoonflower now offer a good range of fabric types and weights, ranging from this lightweight mix to a slightly heavier quilting weight; through to a heavyweight upholstery fabric; as well as a recently added knitted jersey material. They have also, from time to time, added special fabrics while stocks lasted, so it is always worth checking back on their site to see what is available. The full size hanky is over half a metre square, so it is a little awkward getting them up on the Spoonflower fabric, given the width available. They fit two-up across the width, but leave a strip up the side of wasted fabric. Rather than waste this, I had a little brainwave and have created for myself a fabric label to be sewn into the hankies giving my contact details and washing instructions. This saves me from going to the expense of having labels professionally made. The only thing I can’t decide is if they should be white or red to blend in with the hankies so they are not too obtrusive. Luckily space permits me to print both and decide later. I have also got lots of room to add in similar washing labels to go into the Five Trousers I have been getting commissions for recently. So it’s now time to place the order and patiently wait for delivery of the fabric . . .
Just a reminder that this project would not be happening if it wasn’t for the web of Who fans who have contributed along the way. 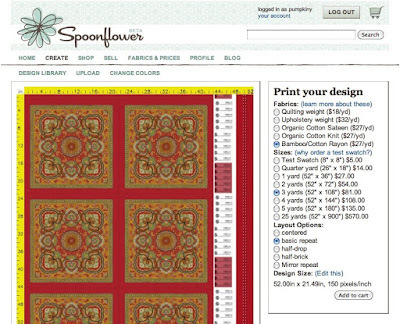 TimeLord25 (aka Bob Mitsch) for setting the ball rolling on reproducing the hanky using Spoonflower. Seventh Doctor Fan (aka George Chase) who own the screen-used hanky from Dragonfire. He gave us the accurate size for the hanky. Cyber did the scans from a hanky belonging to his brother. Doris Wildthyme was the first to identify the handkercheif’s style and circulated images of one he owned on the Doctor Who forum, though sadly they were never of high enough quality to use for this project. Phew, all these new blogs. Iʻm rather finding it hard to keep up with you! Though itʻs worth it as they are always a brilliant read :D.
Everythings looking good. Great idea with the labels.